Munich - Argentinian forward has been one of the few rays of light in SV Werder Bremen's season so far, with four goals and one assist to his name, but even he was powerless to prevent his side succumbing to a 6-0 thrashing away to FC Bayern München on Saturday. Speaking exclusively to bundesliga.com after the game, the down-heartened 25-year-old reflected on his side's performance and gave his thoughts on what Bremen need to do to improve. 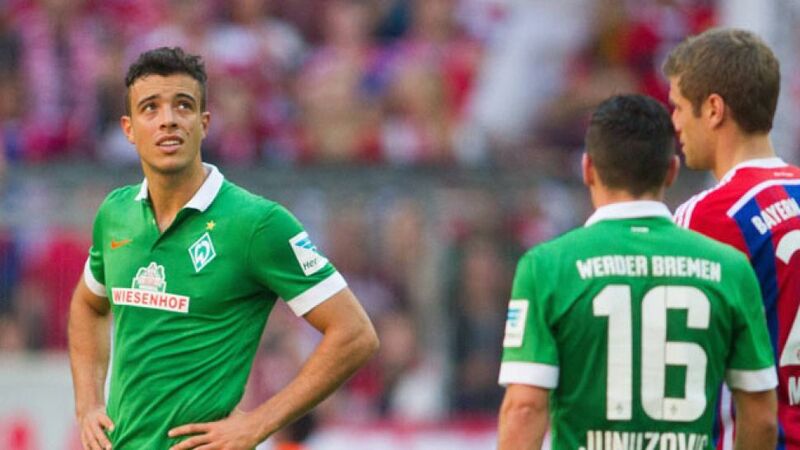 bundesliga.com: Franco Di Santo, such a big loss is always hard to take. What went wrong? Franco Di Santo: We knew we were playing against one of the best teams in the Bundesliga - one of the best teams in the world, in fact. We tried to implement our game plan but it didn’t work out. We need to keep our heads up and make amends in our next game. bundesliga.com: What was your game plan? Di Santo: We knew how they were going to play so we wanted to put up a fight and get them on the counter-attack but it didn’t work out. bundesliga.com: How is it for you playing as a striker in a game like that where you don’t see much of the ball? Di Santo: It’s difficult. We were playing one of the best teams in the world. As you say I didn’t see much of the ball today, but it’s all part and parcel of the game and hopefully in our next match I can get involved a bit more. bundesliga.com: Bremen only have four points and are at the bottom of the table. What’s the mood like in the squad? Di Santo: It’s very difficult, as you can imagine. I don’t think anybody likes to be where we are and we’re well aware of the situation we’re in, but at the same time we’re trying to stay positive. We know it’s up to us to get out of there and there are still plenty of games left. The only thing we can do is keep our heads up and do as best we can in our next game. bundesliga.com: That's against 1. FC Köln, who beat Borussia Dortmund today. What do you need to improve to take points against them? Di Santo: It’s going to be very tough; all of our games are difficult at the moment, especially given the situation we’re in at the foot of the table. Every game is like a final for us so we’ll go out on to the pitch looking to take all three points. We need them and hopefully we’ll get them.